CreationWiki is a free wiki-based Internet encyclopedia of creationism written from primarily a Young Earth Creationism perspective that was started during the summer of 2004 by the Northwest Creation Network, and is the work of an international team of creationists. In addition to having articles regarding the creation/evolution issue CreationWiki has articles on the Bible and Christianity. 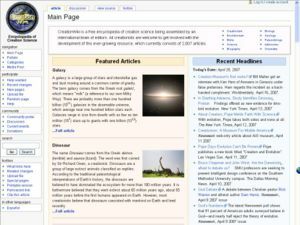 CreationWiki only allows edits from a creationary perspective and although it does permit Old Earth Creationist viewpoints, it favours Young Earth Creationism. CreationWiki was started in part due to the evolutionary bias of Wikipedia. CreationWiki reports on an article concerning creation that was deleted from Wikipedia, and links to the Wikipedia page with the vote for deletion of the article, with the comment that: "Despite Wikipedia's NPOV policy, many voters felt free to vote to delete the article on the grounds that they considered creationism as pseudoscience or worse, rather than on the merits of the article itself." and "no administrators felt the need to remind the voters that they should be voting on the merits of the article, not their personal opinion of creationism". As of 16 May 2016 there were 6,101 articles written in English from a creationist point of view. Considering the other languages​​, there are a total of 8,871 articles. One of the more interesting articles at CreationWiki is their article on Bible scientific foreknowledge. Bible scientific foreknowledge is the concept that holds the Bible contains knowledge that shows an understanding of scientific knowledge beyond that believed to exist at the time the Bible was composed. EvoWiki attempts many refutations of CreationWiki's claims. However, CreationWiki monitors EvoWiki quite closely and has many answers to EvoWiki's claims—and also to those of Talk.Origins and various other pro-evolution organizations such as the National Center for Science Education. CreationWiki is actively expanding into multiple languages. The core site is written in English, but translated versions of the site already exist in Spanish, German, Korean, Hebrew, Chinese, Polish, Portuguese and French. In response to critics of CreationWiki who note its small size and editor base compared to the anti-creationist Wikipedia, proponents of CreationWiki claim that all comparisons should be made to another specialized wiki, EvoWiki. Unlike EvoWiki, which is a wiki that is archived and not actively being edited, CreationWiki has active editors. In recent years, interest in atheism websites and evolutionism has declined. The website traffic tracking company Compete reported that as of August 20, 2012, EvoWiki had only 771 unique visitors a month. Also, global atheism and agnosticism is shrinking in adherents while global Christianity and creationism is seeing rapid growth. Campus Crusade for Christ International (CCCI) is one of the world's largest evangelism organizations within Christendom and has over 25,000 full-time missionaries. In 2006, Alan Beeber of CCCI predicted that internet evangelism will result in more conversion that all other forms of evangelism for CCCI combined. "The progress of science in furnishing the government with means of espionage is not likely to stop with wiretapping. Ways may some day be developed by which the government, without removing papers from secret drawers, can reproduce them in court, and by which it will be enabled to expose to a jury the most intimate occurrences of the home. Advances in the psychic and related sciences may bring means of exploring unexpressed beliefs, thoughts and emotions. 'That places the liberty of every man in the hands of every petty officer' was said by James Otis of much lesser intrusions than these. 1 To Lord Camden a far slighter intrusion seemed 'subversive of all the comforts of society.' Can it be that the Constitution affords no protection against such invasions of individual security?" Louis Brandeis (1856-1941), United States Supreme Court Associate Justice Dissenting, Olmstead v. United States, 277 U.S. 438 (1928). ↑ Round 2: Jesus vs. Evolution and PZ Myers and Richard Dawkins - Jesus triumphs again! Onward Christian soldiers! ↑ Did an attempt to revive EvoWiki fail? Is Google Panda mauling EvoWiki, Talk.Origins and atheist websites? This page was last modified on 23 March 2017, at 23:04.